Insidious: The Last Key Review: Sharp, suspenseful and above all terrifying! 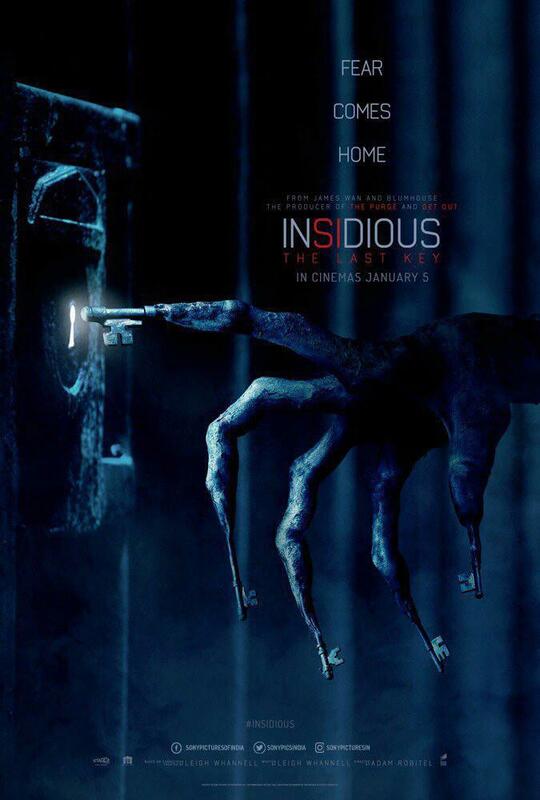 Curious to know how is the latest instalment of the Insidious film franchise? Read Insidious: The Last Key movie review exclusively on BollywoodMDB before booking your tickets. Demonologist Elise Rainier ( Lin Shaye) returns to an old, sprawling house in New Mexico with two of her aids (Angus Sampson and Leigh Whannell). It is the same house where she had spent her tortured childhood, lost her caring mother and fled to escape from the terror of her insane jailer father, leaving her younger brother Cristian behind. The previous night she had received a call from the new inhabitant of the house, who pleaded Elise for help from some malevolent forces in the house. Initially reluctant, Elise decides to help the man she had never met, using her special power of talking to spirits. But as she reaches that standalone house nestled in a monstrous mountain, she realizes there is more than meets the eye. Will Elise be able to help the man? Who is the spirit haunting the house for decades now? Will she put her own life on stake while protecting others? To know, crawl into a cinema in close vicinity to you. There is no doubt that a horror film relies more on suspense and thrill that scare the crap out of viewers, but if it does not have a brilliant cast to enliven its plot with their acting abilities, then anything hardly solves the purpose. Thankfully, Insidious: The Last Key has amazing performers to invite you in this nightmarish world of horror and scares. In the lead role, Lin Shaye, who plays Elise Rainier, delivers an impassioned performance. The whole film relies on her and the brilliant actress pulls it off amazingly well. Leigh Whannell and Angus Sampson as Elise’s assistants do full justice to their characters. Though their job in the film is to help Elise out in her work, they provide comic relief amidst freakingly chilling narrative more often than not. Other actors in the supporting cast lend full support to the primary cast. Let’s face it, the story of Adam Robitel's latest offering is a bit thin and doesn't give you a sense of complete originality, but the ace filmmaker makes it look impressive with his directorial skills, creating a delightfully creepy atmosphere along with a lot of moments of suspenseful anticipation. A good horror film is known by its suspense and thrill and, thankfully, Insidious: The Last Key has both elements in abundance. A few moments into the film and it gets into your skin. In the very beginning, the director creates a dread air and maintains it till the last frame of the film, delivering heart-pounding horror in between. In short, Adam Robitel’s latest plunge into the darkness is praiseworthy and his film inviting enough for a watch. Besides its taut story and ingenious screenplay supplemented by immersive performances by lead actors, Insidious film franchise is also known for its technical brilliance. Like its predecessors, Insidious: The Last Key is also good on multiple technical levels. It is powered by an efficient camera work by Toby Oliver and sumptuously nuanced production design. The background score of the film is superb. All the locations used in the film justify the setting and add up to the thrill element. Production value of the film is in top order. VFX and CGI work of the horror flick are outstanding. Despite its third instalment failing to live up to the expectations of the audience, Insidious has been one of the widely popular film franchises across the world and undoubtedly one of the most loved horror film franchises to have ever come out from the stable of Hollywood. The series has innumerable fans here in India as well, which makes it clear why its latest instalment is so much awaited. If you have watched all previous parts of the franchise, Insidious: The Last Key is a must watch for you. If you haven't seen its prequels, you will still enjoy the film provided you have a thing for horror genre. But there is a common thread that connects Insidious: The Last Key to its immediate predecessor, Insidious: Chapter 3. If you haven't watched that part, you might find some things beyond your ken. So, it is advisable that you watch previous parts before you enter cinemas for the latest instalment. Hollywood Release 2018: Insidious: The Last Key, film that will give nightmares!